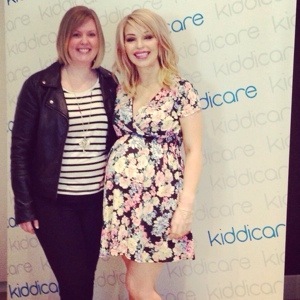 On Friday I was lucky enough to win a ticket to attend a very special event at Hayes Kiddicare store to hear Katie Piper talk about life, pregnancy and her expectations for her life as a parent. I’ve followed Katie’s career for a long time, she’s such a strong, courageous woman. The chance to hear her talk in person prompted me to book a days annual leave and drive to London from the green fields of Hertfordshire. I decided not to take Dexter with me, I didn’t want to take him out of nursery for the day and I knew that he’d be an outrageous flirt with Katie so it was just best all round that he stayed well away! I arrived at the store to lots of smiling faces. The staff were just brilliant, especially a lovely lady that checked me in and the fabulous cafe staff, even when I nearly burnt one lady with my coffee. I took my seat early, IG’d a couple of pictures and drank my latte whilst people watching. A number of mums, babies, toddlers and frightened dads arrived, whilst some PR types milled around waiting for the talk to start. Katie arrived looking very beautiful and natural and at 38 weeks her bump looked perfect. Not a hair out of place and wearing fabulous high heels I felt slightly miffed I’d not made more of an effort myself. Katie spoke in a natural way about how she’d been feeling about pregnancy, how she’d been looking after herself, the cravings she’d had and how she felt about having a girl. I enjoyed the Q&A session (of course I spoke!!!) There were a few questions from twitter etc and some from the floor. Tips also came in for Katie from some great mums in attendance, I really giggled at a lady sat at the back when she mentioned she was trying to work out the wifi code for her toddler to watch the iPad before he had a meltdown! We’ve all been there! I found the event really inspiring. Katie was down to earth and seemed genuinely grateful to receive some tips from us all, in fact she even tweeted me back to say thanks. And I know it’s totally self-indulgent to post this picture but I am so chuffed, please let me indulge! I was also lucky enough to meet Katie after her talk, have a picture with her and got to take home a Kiddicare goody bag. 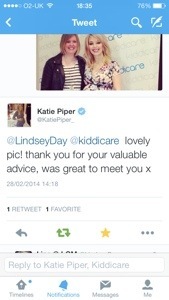 I think Kiddicare have struck gold by using Katie as an ambassador, you’ve just got to read her tweets to see she’s like the girl next door. I had a great morning out and not only did I meet Katie but I also got to meet the very lovely Jenny from Kiddicare and a lovely mum who I plan to keep in touch with over the tinternet. What a great opportunity, thanks to Katie and to Kiddicare.